Following the devastating earthquakes in 2015 in Nepal, we conducted a number of relief programs to earthquake survivors. Some of these have grown into ongoing projects (such as the Sustainable Farming programs) [link to new Sustainable Farming program]. Some of them resulted in long term relationships with communities and students. As a result of the healing activities with the children and communities we work with, we had a whole lot of poems, stories, reflections, images, artworks which showed another side of Nepal’s quakes to the one portrayed by the media. Inspired by Australian children’s author, Libby Hathorn, who challenged us to find a way to share this content, Heartquake was born. Heartquake is an online portal which gives a voice to the survivors of the quakes and provides an insight into their experience. It also contains lesson plans for teachers in Nepal and overseas to use the information with their students. Below is a summary of the other support we gave during the recovery period immediately following the quakes. These are just numbers but keeping in mind that we have a small team and that every single part of this support was hand-delivered with love and compassion by at least 2 members of our team who sometimes had to walk for hours and in some cases days to reach these communities, you can see how hard we have been working to ensure that your love and generous support makes it directly into the hands of those who need it the most. Babanath is in class 9. His mother and younger brother are mentally disabled. His father is physically disabled. They lost everything in the quakes. Babanath takes his responsibilities for his family so seriously but he never misses a day of school either. He is a very committed young man. 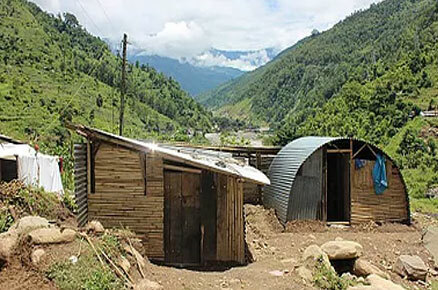 An organisation had built them a tin shelter after the quakes but it leaked in the rain and then was damaged by a landslide. We agreed to build them a solid truss home (which was their choice – we offered them a bamboo house but they didn’t feel safe. The house is pictured below). When the house was finished, Babanath told his father, “Baba, we are rich now. We have a proper house. Now our time to improve our lives has come. We must work hard.” He is such a humble, hardworking young man and it is a privilege to be able to support him. We have also bought clothing for him and his family, as well as a new uniform, books and bag for Babanath. 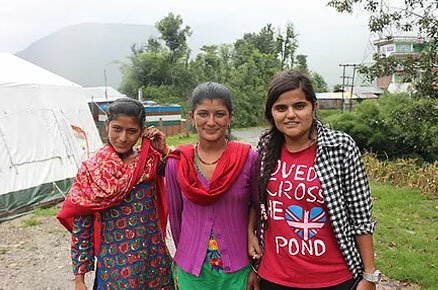 Bandana, one of our Mitrataa team who completed her SLC (class 10) exams not long before the quakes, received a call for help from her friend in Thame, Solukhumbu. There was a community there who had no access to food or support and were freezing in the unseasonal snow. Bandana came to me and asked if we could help. We told her, of course, if she could find a way to get food and supplies to them. We tried to find a helicopter to take her but we got the run-around as the government had limited all private choppers and directed them to the main affected districts. Bandana refused to give up and continued to try all possibilities until finally she managed to get 2 tickets on a flight to Lukla (she had never been on a plane! ), from where she found some people to help carry supplies and walked for 2 days to Thame to deliver the relief to the people. The people of Thame couldn’t believe that she had heeded their call and what she had been through to make sure they had food, blankets and tents to shelter their community from the snow. Bandana’s determination to keep her commitment regardless of the hurdles she faced is one of my favourite examples of leadership we saw amongst our team during the earthquake relief programs. We received a call for help from a friend from Sindhupalchowk. He told us that one of the main problems the women were facing was a lack of underwear as it had all been destroyed in the quakes and in an area facing very high trafficking (of people and kidneys), they felt unsafe and unprotected. We also wanted to help find a solution to provide a more sustainable income source for the villagers moving forward so they are not dependent on aid and donations but can support themselves. 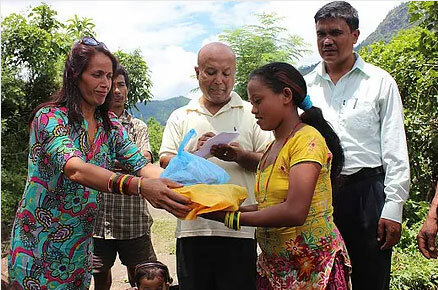 We delivered seeds and underwear/clothing to 100 women in Sindhupalchowk and will be supporting the women to establish an organic agricultural cooperative, including training and a guaranteed market for their products to get them started. 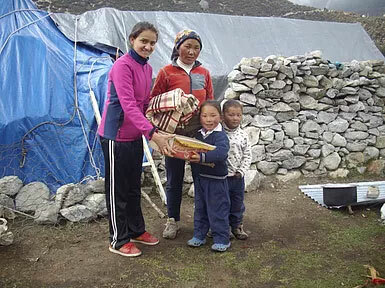 Another friend had told us of a girl in Sindhupalchowk who was in trouble and needed support. He gave us sketchy details and a phone number. We asked our other friend and fortunately he knew her village and it was not far from where we would be working. 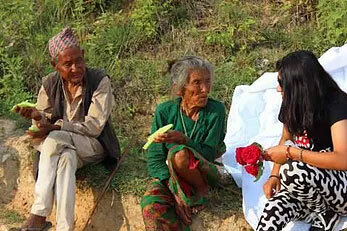 We were not able to get up to her village due to landslides but she trekked for 2 hours down to meet us. Our friend was right. Parbati’s family was in trouble. Their father had been killed in the earthquake. There are 5 daughters and 1 son (who is only 6 years old) left behind with their mother. They have a very small amount of land, not enough to live off. Their father had loans of 350,000 rupees when he died. He took these loans to build the house which was completely destroyed. The oldest daughter is married and doesn’t live with the family. 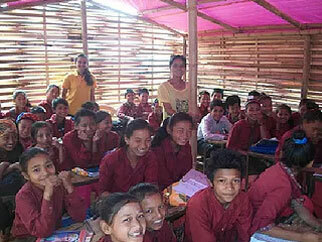 Parbati, the second daughter, is in class 10 this year. She was going to leave school to work in the fields to feed her family. Their mother is weak and sick from malnutrition so cannot work much. The next daughter is 14 in class 8. The family received 100,000 rupees from the government as compensation for their father’s death and they used this to pay off part of his loan as the loan sharks are circling. They are still asking for more of the loan to be repaid and now the child traffickers have stepped in and want to take 2 of the sisters in exchange for the rest of the debt. Parbati really wants to take care of her family. She is determined. So we found a local village elder who agreed to be their guardian (as you know, having a male guardian is very important in Nepal). This will keep the traffickers away. We are in the process of building them a proper shelter and to help them set up a chicken farm (they don’t have enough land to sustainably farm vegetables). We have guaranteed with our partner that we will buy whatever they farm. And he will train them. We also have a sponsor who will keep the kids in school in the village so the family stays together and Parbati can complete her SLC. 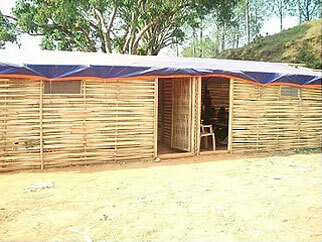 Bamboo schools and homes – and some challenges! As you know, we focused on trying to get shelter for as many people as possible before the monsoon set in. 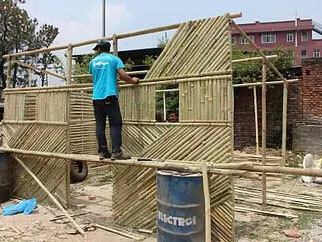 We chose bamboo because it is safe in earthquakes, environmentally friendly and relatively cost effective. We ran into some challenges with this project but we learned a lot along the way. Mitrataa’s approach is always to engage the communities, build trust and relationships with them and to focus on enabling them to empower themselves rather than creating dependence. 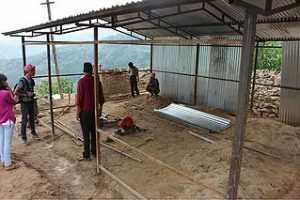 We agreed to build a bamboo school in Nuwakot on the condition that the community would provide tin for the roof and labour to support the experts we would send to teach them how to build with bamboo. We also agreed to a longer term partnership with the community to help them improve the quality of education for their children. The community was very excited and keen to get started. We set to work, sending our volunteers to counsel the children who were all traumatised by the quakes and ongoing aftershocks and to run classes for them to get them back into their routine. The children were so excited and their parents couldn’t believe that they were begging for homework, they were so happy to be learning. Bandana and Nirmala did a fantastic job of motivating them! We also sent our experts to help build the first 2 classrooms and teach the local community how to build as well as a truckload of bamboo. Unfortunately, two other organisations had come into the village and offered to rebuild classrooms with no effort or contribution required by the local community. These organisations have good intentions but they come, they give, they leave which creates more expectation, entitlement and greed from the locals. Despite losing out on the longer term benefits for their community, the locals decided to go with the other organisation even though we had already completed two classrooms and another four were underway. We completed the six classrooms and left the village feeling very sad. We encountered this challenge a lot. Many organisations were not interested in working with the villagers, asking what they wanted and involving them in decisions. They simply came, built, gave and left. They want to help but long term are creating dependent villagers who feel disempowered and as though they have no control over what is being offered to them. Still, we learned a lot and continue to remain committed to providing respectful, culturally appropriate, sustainable support to the communities we have the privilege of working with. None of this would be possible without the generous support we have received from so many people and organisations. It is an incredible privilege to be able to tell these families that we will walk hand in hand towards a better future for them. We cannot even begin to thank you for your wonderful support. Your support directly impacts the lives of these communities and we continue to work hard to make sure they get what they need to not only bounce back from these earthquakes but to bounce forward to a better, more sustainable future.